May I introduce Dal Bhat. If you’ve been to Nepal, you are already friends. After enjoying the most amazing traditional Nepali lunch earlier I had the urge to share with you all the delights of Nepali cooking. My tastebuds were dancing and I felt inspired. 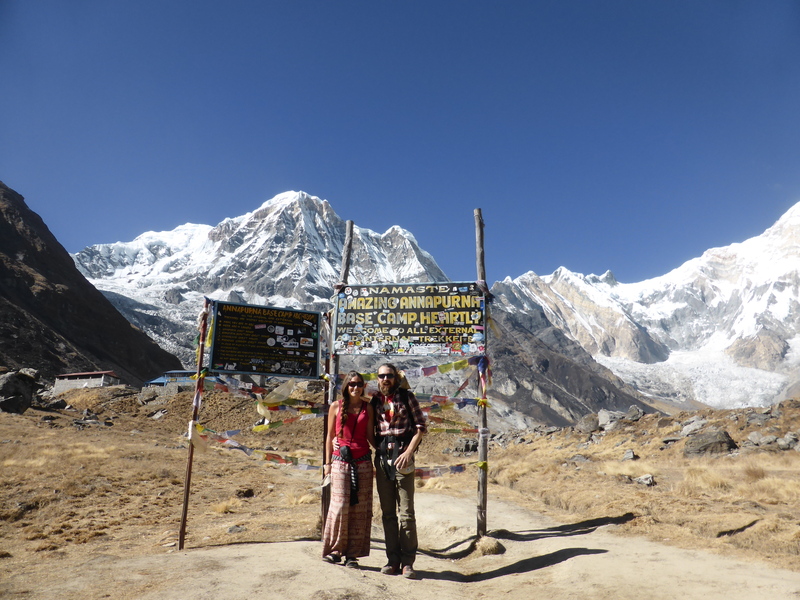 We’ve been here for two months now, travelling around, walking in the Himalayas, meeting the most amazing open hearted and kind folk. As usual, we’ve done a fair amount of hanging out in kitchens and nibbling things. We’ve been very pleasantly surprised by what Nepal has to offer and this is all made even more amazing by the fact that so many dishes are plant-based wonders. Compared to China, life’s a breeze for a vegan exploring these stunning landscapes. 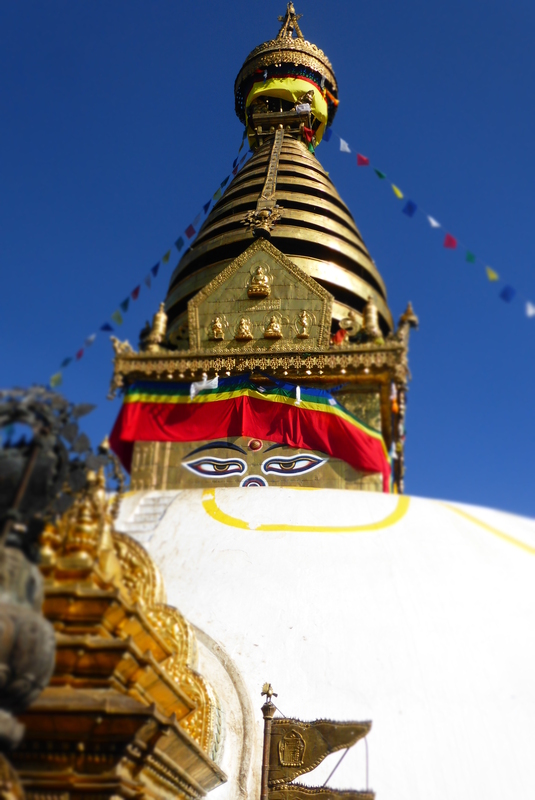 Nepal has a fascinatingly diverse and ancient culture, very distinct from Northern India and surrounding countries. Nepal is technically a Hindu state, but many people we speak to are Hindu/ Buddhist. They respect and adhere to some of the beliefs, festivals and rituals of both. There is a great open mindedness about spirituality and it shows in the culture. Nepalis are very tolerant, peace loving people and they know how to cook! Nepal is basically the Himalayas in the top half and some flat lands in the south, there are countless valleys and micro-climates which means a huge diversity of crops; mangoes thrive in the south, millet and potatoes in the north. There are many ethnic groups, the main ones being the Thakali and Gurung (north) and the Newari (Kathmandu valley) and Terai, further south, Lohorung in the east. It’s a melting pot of cultures which can only add to the brilliance of the cuisine. Dal (lentils) Bhat (grains, normally rice) is what fuels this lovely country. Twice a day, every Nepali eats a big plate of Dal Bhat. I’ve never been to a country that adores a single dish so consistently. Nepalis normally have a nice cup of strong tea for breakfast, maybe a baked good of some description, but the tastiness really kicks off around 11 am with an early lunch of dal bhat with some chutney or pickle (achar) and a tarkari (veg side dish). We love the fact that you normally get some fried greens, mustard leaves are very popular, and also the fact that in most restaurants seconds and thirds are politely enforced. If you turn your head for a second, your pile of rice magically grows. It’s very rare that you leave a premise without being totally stuffed full of spicy veggies. You will sometimes also get a nice little salad going on and one single, solitary, tooth meltingly spicy chilli. To be eaten raw by the afeciandos and fool hardy. I love em! Certainly wakes you up. Dal Bhat is also served for dinner, again an early sitting, 6pm-ish. I like the simplicity of it all. All over Nepal, you hear the pressure cookers hissing in the early morning. The pungent aroma of frying onions and spices are to me something synonomous with the haze of Nepali mornings. Everyone one knows where they stand food wise, no over complictions, and it must be so easy for the home cook. No one needs to ask whats for dinner! Of course, the veggies vary and the dal morphs from legume to legume, but the combo remains undiminished. Dal bhat rules. The dal component can mean anything, but mung beans (halved) are very popular. You may also see some rajma (kidney beans – Jane’s recent favourite, see our recipe here) and chana (brown or normal chickpeas). When I make dal, it’s thick and hearty, but you’ll find in Nepal and India, dal is more like a soup. If you’re very luck indeed, the restaurant may have a tandoor oven which opens the door to all kinds of stunning breads. Warm and crisp naan being the royality of any tandoor behaviour. Fortunately for the nomadic vegan in these parts the veggies are very, very tasty. Up in the mountains and in the countryside most people have their own veg gardens that really thrive. The produce is delicious; potatoes, carrots (quite expensive for some reason), spinach, chard, cauliflower, broccoli, turnips, long white radishes (like daikon), mustard leaves, bitter gourd, green beans, cabbage, tomatoes, cucumber. We’ve even seen some pumpkin, but it’s a rare and very special event. A beetroot curry has been savoured on one very special evening. Even the stuff you buy from bigger Kathmandu markets is packed with flavour. We’ve enjoyed using this abundance in recipes in our little flat in Kathmandu, up in the north, a local neighborhood with dusty roads and a gently chaotic and superbly friendly nature. We have a little kitchen and a sun trap terrace. But dal bhat is not the end of the line. There are also such delights as momos (technically they’re from Tibet, but they are loved all over Nepal and there are many Tibetans living here), things like Chow Mein and Thukpa (Tibetan noodle soup) have also made the hop over the Himalayas/ border. Barley, millet and buckwheat grow well in the cold areas and you’ll find these regularly made into a range of noodles or tsampa, a flour which is made into a hearty porridge. This is perfect early morning fuel for a day hiking. You’ll also find these grains being made into Raksi or Chang, potent distilled moon shine or quite a mellow wine like booze that is mixed with fruit juice sometimes. It’s perfect chilled with apple juice! On average, 15p per cupful. These cooks are superheroes. 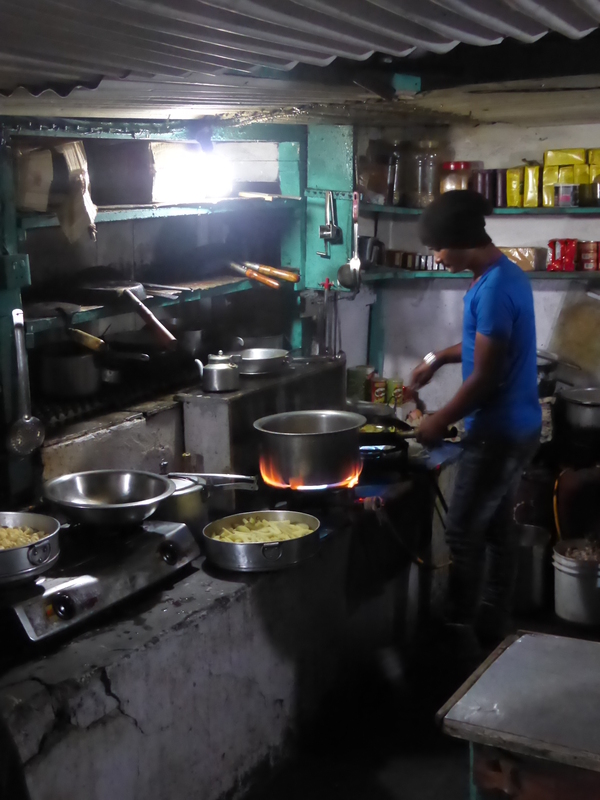 Nepali cooks are very talented and capable of creating complex menus/ meals with very basic equipment. Plus, this guy was cooking at about 4000m up a big snowy hill. So what was so special about todays lunch? Thamel is the main tourist area in Kathmandu. A jumble of lanes loaded with tourist traps of all forms and agendas. You can get food from all over the world, but pizza doesn’t interest me in the slightest in Asia. I could eat rice 24/7 anyway, so I’m never in the market for a seeded loaf or crepe when I’m wandering in Eastern parts. We stumbled across a little old doorway, we ducked in and it opened out into a courtyard with beautifully carved wooden window ledges and perfectly wonky old walls. Our host was toothless and beaming wearing a traditional Nepali hat. We knew it was a proper joint, the kitchen was a hive of good natured activity. I was excited as my expectations soared. Most Nepali’s eat squating or sat cross legged on the floor, but in more urban restaurants, you’ll get a chair and tourists are always supplied a trusty spoon, although sometimes I like eating with my hands. Really getting to grips with your food! Just always remember, right hand only. Left hand is a no go area for reasons I won’t go into on a food blog. 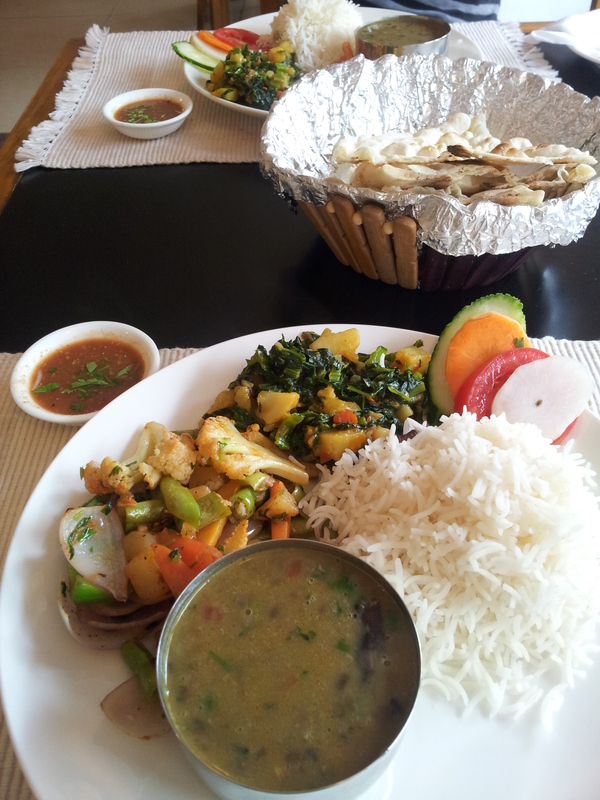 Safely perched on our chairs, we both went for the Nepali Veg Set or Khana, which is something we love. It’s like Dal Bhat with a few more trimmings. I went for dhendho with mine instead of rice, like a thick buckwheat porridge. An earthy, wholegrain polenta. The smells escaping the kitchen, a tiny room with very low ceiling, were tantalising. No less than four pressure cookers were violently hissing, like some kind of out of sync steam train. The waiters all fussed around us because there was only another couple of people in there and they were big fans of Gareth Bale (he’s a Welsh football player for non-sporties and officially the most famous Welsh person ever). It’s always very strange to visit some very remote mountain village, lost to the vastness of the mystical Himalayas, and find a picture of Wayne Rooney pinned up beside Krishna in your family hostel reception. I wonder what Wayne thinks about this kind of hero worship? I wonder if he even knows!? I know what you’re thinking, ‘that’s a big pile of dhendo!’ With all the Thakali style trimmings flavoured with the mighty ‘jimbu’. Anyway, lunch was ace. 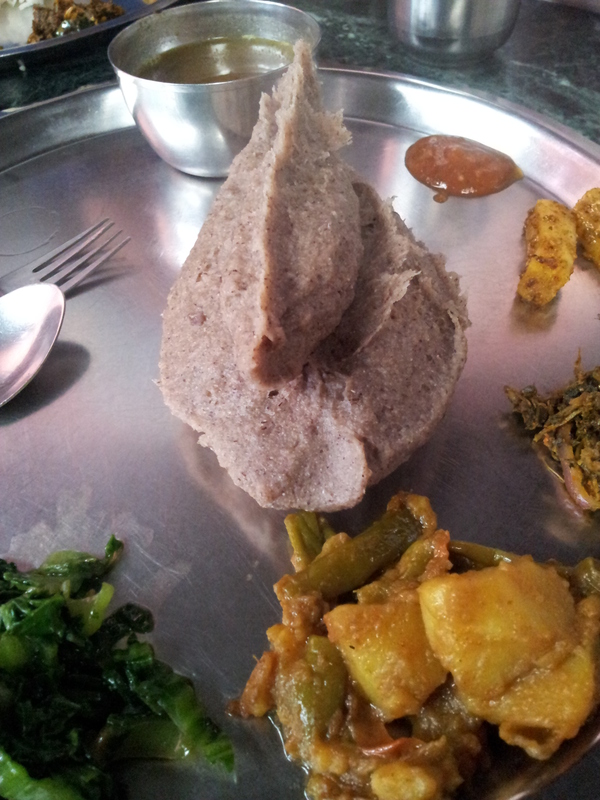 Very traditional and a real taste of the Thakali style of cooking. An ethnic group from mainly Mustang in northern Nepal (a fascinating region if you’re a culture/ history buff btw) which stretches down to Pokhara. The Thakali’s love nothing more than flavouring their dishes with the brilliantly named ‘jimbu’. It’s a member of the allium family, think potent onions crossed with chives, normally used to flavour dal but it was also evident today in the tarkari dishes. A delicious herby twist to the normally spice laden sauces. The mustard leaves were radiantly green and fresh, there was even some gundruk, something you don’t always get. Dried and fermented saag, which is a loose term for green leaves but something normally like spinach. This was all finished off by some pickled white radish and a punchy chutney of tomato and coriander; plus crisp popadoms, some chopped up salad bits, a slice of lime and one of those highly explosive green firecrackers (chillies). What a feast! How many textures and flavours can you cram onto a large tin plate?! All for the modest sum of £1. You heard me right, £1! And we still get people writing in asking why we choose to travel all the time. £1 goes a long way in certain parts of the world and it can certainly buy you some delicious lunch options. A random, yet delicious falafel wrap in Kathmandu. 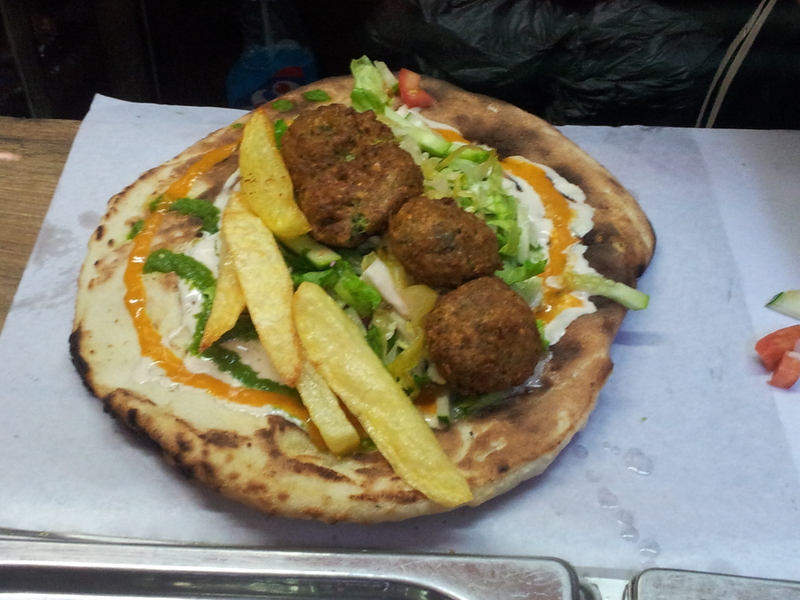 I may not seek out crepes when travelling, but falafels are always welcome. Other Nepali specialities we’ve encountered include bread made from grains like millet or buckwheat (gluten free options abound), fermented soya beans (kinema). We stay with an amazing family in Kathmandu, papa is called Raju and he takes wonderful care of us. He was the first face we saw off the plane from Beijing, escorting us through the tangled Kathmandu streets on his motorbike (a Honda ‘Enticer’). We love visiting Rajus family home and checking out what his sisters (he has seven!) and Mum are up to in the kitchen. 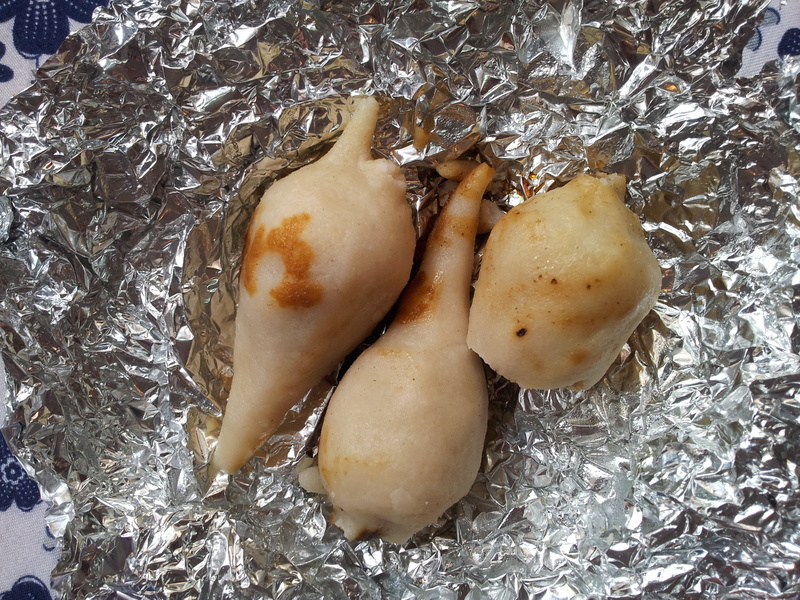 We’ve had some of our favourite food there, especially the popped, squashed and dried rice (baji) staple. A dish normally served with roasted peanuts and different tarkaris (curries). Something very uniquely Nepali and, I must admit, a little strange at first. More like a pile of crunchy breakfast cereal has invaded your plate. One of the most interesting dishes that Raju has introduced us to is Yomari (or ‘tasty bread’ – see below). It looked like a hand crafted parsnip. It’s actually made out of rice flour dough and stuffed with cane sugar, giving a gooey sweet middle. It looks really tough to prepare and is loved by Nepalis. Traditionally made for the Yomaru Puri festival, these funny things are something to do with an offering to the God of Wealth (Kubera). There are so many festivals and religious rituals going on in Nepal, it’s almost impossible to keep pace. I’ve never had anything like it, but I always appreciate a parsnip and the exploding soft sweet centre was a treat. Snack wise, our favourites are the peanuts sold off the back of carts. Simple but effective. They are roasted in sand and kept warm in big piles with traditional wood burning clay braziers. Expertly moved around by the vendour. A great smell on a brisk January morning. A big bag is around 50p or less. We’ve had some tasty samosas and also doughnuts, which the Nepalis call ‘sel roti’. You’ll also get some dried fruit and roasted soya beans. There are of course the massive corporations here dishing out crisps and poor quality chocolate. In bus stations you’ll find men wandering around with big baskets on their heads filled with a selection of warm breads and pastries, all wrapped up snugly in colourful cloths. Dessert wise, Nepal is probably not going to blow you away. There are not the volume of sweet shops that you find in India. Kheer is a constant, sweet rice pudding with dried fruits and coconut, but as a vegan, you’re really looking at fruits. The papaya is sensational. I have no complaints. After three plates of dal bhat, I’m nowhere near the market for dessert anyway! Randomly, some of the best sweet things can be found half way up mountains. Little homestays do a roaring trade in fresh apple pie for weary hikers. Of course, we’re only writing about the vegan highlights here. There are vastly more dishes that contain meat and dairy. A vegan must always be aware that many dishes are fried in ghee (clarified butter). Many Nepalis speak very good English so explaining your needs is reasonably straight forward. 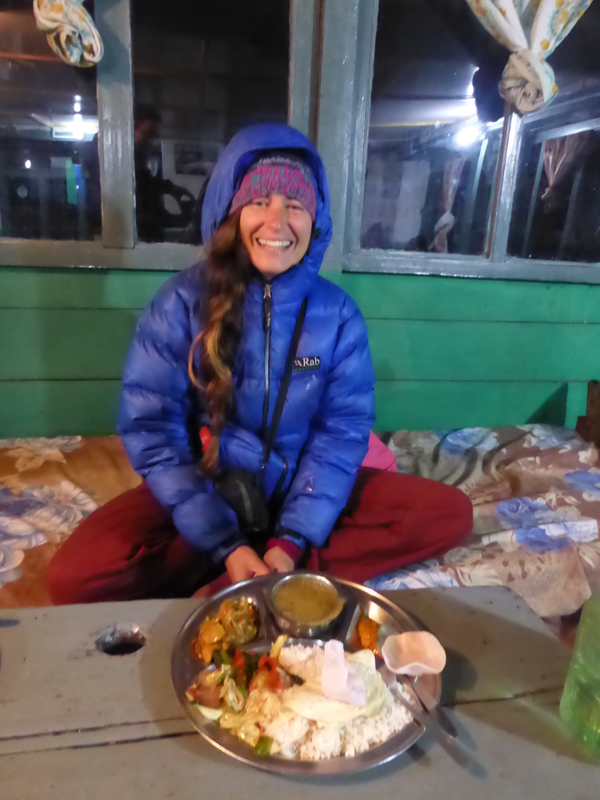 Even though Nepal is Buddhist (Gautama was born in Lumbini in the south) and Hindu, most people are meat eaters, especially in the mountains. Veggies are harder to grow up there where arable flat land is scarce. There are some signs in more touristy areas offering vegan options. I feel that Nepalis are open minded, there has even been discussions about making Nepal an organic only country! Big ambitions. But what a great idea. With an ethical, peaceful Buddhist and Hindu approach to things, I can also see veganism really connecting here. After all, the veggies are amazing! We’re off for dinner in one of our favourite local Newari restaurants where the chef is a genius (he actually wears one of those proper chef white jackets with proud and shiny buttons) with all things spice and they have a tandoor oven that looks like an antiquated space rocket. When it’s cranked up it actually sounds a bit like one. The naans melt in the mouth, especially when dipped into a feisty bowl of beans or used to mop up the last drops of tarkari. I’m getting hungry now……..
See here for more of our Indian/ Nepali inspired recipes. You can also peep up with our antics on Facebook and Twitter.